LOGAN – Turnout pants, helmets and Self Contained Breathing Apparatus made up the attire that an instructor and student of the Firefighter Recruit Candidate Academy of Bridgerland Applied Technology Center chose to run the First Dam 5K Run in. Instructor Heath Banbury and student Ryan Ottley were joined by the program’s director Brian Davies and his 10-year-old daughter Ivey. Also participating in Saturday’s run were assistant director of Fire and Rescue Services Jeremy Robertson, another student in the program, Rashelle Johnson, and former student Adam Miller. “It’s like breathing through a straw,” said Banbury. Having their air tanks on and running made the run more challenging for the two men. Firefighters wear a Self Contained Breathing Apparatus whenever they go into situations where air may not be easily accessible. When using the apparatus you are not able to take a full breath in or get as much air as you would like with each breath. The other four participants from their group were wearing their helmets, turnout pants, and BATC T-shirts. About 250 runners showed up for the run despite the snow, clouds, and cold that was intensely present. The First Dam Run consisted of two races, a 10K and a 5K. The run was open to anyone who wanted to participate. There were experienced and competitive runners, as well as amateurs who were participating to simply get outside and get some exercise. Adults, teenagers, children, and even a few dogs participated in the run. 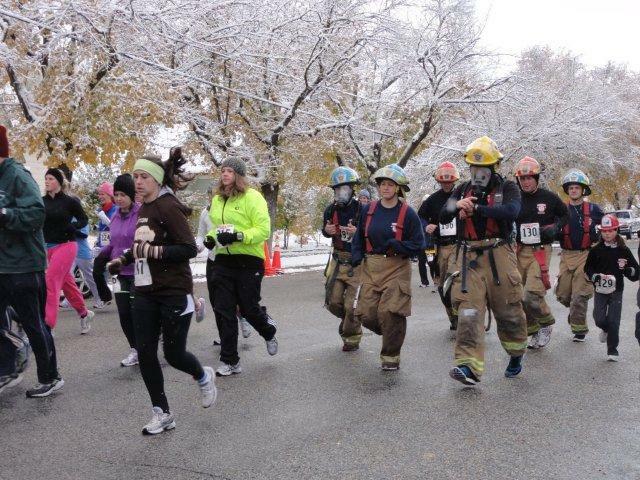 Banbury came up with the idea to participate in the run and to wear their firefighting gear while running. He thought doing the run as a group would be a good opportunity for them to work together. Successful participants in their program have to meet strenuous physical demands as well as have the ability to work well with others in stressful situations. The run in their gear and as a group promoted teamwork and helped them gain experience of working in intense situations with their gear on. The Recruit Candidate Academy program is extremely intense and grueling. Participants attend class that involves training three to four days a week for about six months. They have to be extremely committed to be successful in the program. The students have to show up every day and give it their all in every exercise, test, and training they participate in. Each day of class starts out with physical training. The students do many different exercises to get their bodies in shape and prepare for different situations they may be faced with. They participate in both live as well as simulated fire drills. They also participate in vehicle extrication, ventilating roofs with chainsaws, and hazardous material training. The students have been seen running up the Old Main stairs on USU’s campus, the River Trail, or around the BATC campus, sometimes with ropes around their waists tying them together as a group, other times with their air packs on or 50 feet of hose on their shoulders as part of their training. “In this program we develop teamwork, teach students, and encourage students to do their best,” said Robertson. Once the students have completed the schooling and training they move on in their careers and lives, but their relationships with the directors, instructors, and other students do not end with graduation. They are invited back to attend events and trainings, such as the First Dam Run. The students will also be invited to participate in other community events to promote BATC and the Recruit Candidate Academy program. “What is unique about our program is it’s a lifelong relationship,” said Robertson. Those interested in the Recruit Candidate Academy program can find more information on their website, www.batc.edu.